A fun activity for middle school students. 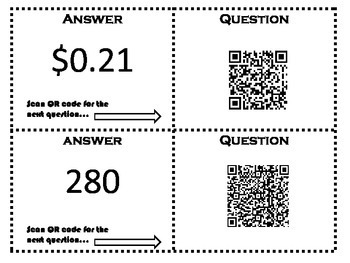 Students will need a device with a QR Code Reader. The activity is sets of cards that must be cut out and spread around the room. 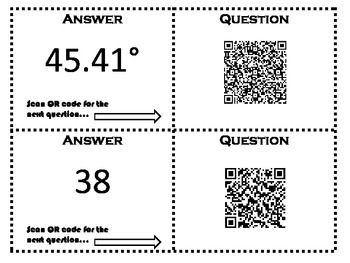 When students scan the QR Code on the first card they are given a problem. After solving the problem they look for the card that has their answer to get the next problem. Students will finish where they began. 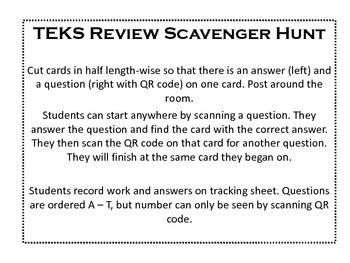 Questions are a review of main items covered in 6th grade math that will be tested on STAAR. Mostly word problems. Easy and fun activity that can get kids up and moving. Can easily be done in pairs. 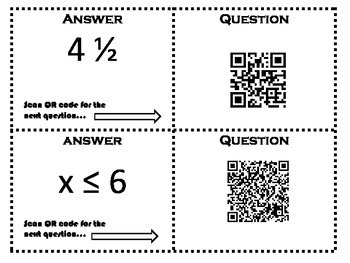 For an additional resource for 6th Grade STAAR Math review, check out my 5 day prep packet here!